A program designed to teach students based on his/her learning ability and competency rather than his/her age in a small group environment. Why Accelerated Competency Coaching Program (ACCP)? This is the moment when you set your child’s life in motion. Choosing the right primary and secondary schooling programme is the first and most important step. We believe our students deserve the very best and we know your child needs the best academic preparation to help them achieve the most sought-after university programmes and careers. You are not just choosing a schooling programme for your children, you are helping them to realize their fullest potential by placing them in an environment where dynamic teaching, personal attention and experiential learning is part of our culture. 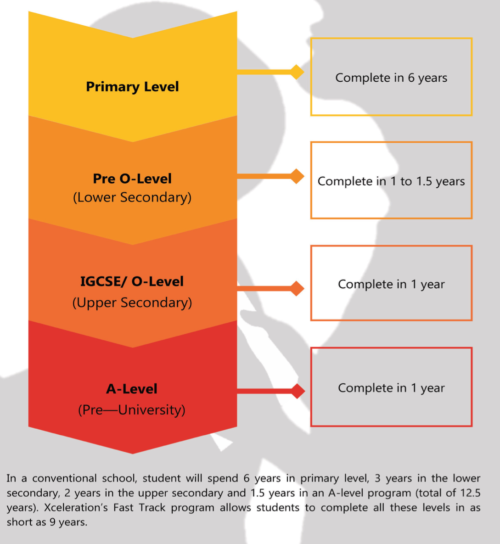 Students from other private institution transfer to Xceleration for our ACCP for a wide variety of reasons. Those who do make the decision to join us rarely regret it. We adopt course syllabuses from Singapore and United Kingdom. Textbooks and teaching materials are brought in from Singapore & UK. We would like to do away with “spoon-feeding” and equip our students with skills that will help them face the real world. We will stimulate the students to ask questions, solve problems, tackle projects and conduct researches. Classes are conducted from 8:00am until 12:30pm. Both Pearson Edexcel and Cambridge International Examination (CIE) are one of the world’s largest providers of international education programmes and qualifications for 14-19 year old. Their syllabuses are continuously updated and reviewed so that students gain skills to transit to their higher education and a rapidly changing world successfully.